Surprise someone special today by sending a Floating Hearts in Love Double Bubble Bouquet. These unique balloons feature clear skin by showing off their brilliant shapes inside, and non-oxidising, latex-free material. Option #1a: An eye-catching Bouquet including the 24" "Floating Hearts in Love" Double Bubble, Three - 11" Solid Colour Red and White Latex Balloons, Valentine's Chocolates and four Love Coupons in a gift bag, $25. Option #1b: An eye-catching Bouquet including the 24" Floating Hearts in Love Double Bubble, and Five-18" solid colour foils attached to a Foil Weight, $35. 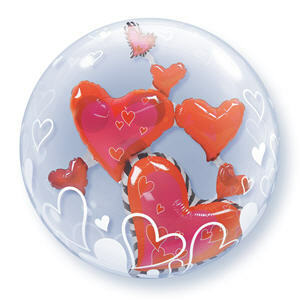 Option #2: An eye-catching Bouquet including the 24" Floating Hearts in Love Double Bubble, a Dozen 11" decorator and solid colour latex balloons attached to a Foil Weight, $39. Option #3: An eye-catching Bouquet including the 24" Floating Hearts in Love Double Bubble, mix of Two-18" Themed Foils (please specify theme), and Three solid colour foils attached to an 8-10" plush animal or basketful of jelly beans and cookies, $44. Option #4: An eye-catching Bouquet including the 24" Floating Hearts in Love Double Bubble, Three-18" Love Themed Foils, Seven-11" decorator and solid colour latex balloons attached to a bottle of Saskatoon Berry non-alcoholic Sparkling Cider, $51.